Some critics of GMOs and dangerous pesticides are using the much-hated TTIP trade agreement to back the argument that the UK would be better off leaving the EU. Their argument goes like this. TTIP is being negotiated between the US and the EU; TTIP, if passed, will flood Europe with the US’s unwanted GM crops and dodgy pesticides; and therefore the way to keep the UK safe from both is to leave the EU in the so-called “Brexit”. It is true that the aim of TTIP is to flood Europe with GM crops and to dismantle our hard-won environmental and public health protections. That would include bringing back pesticides that are currently banned or restricted in the EU but allowed in the US, like the gender-bending atrazine – banned in the EU since 2004 – and bee-toxic neonicotinoids. But people are badly mistaken if they think that the Cameron government, if freed from the constraints of the EU, would avoid a TTIP-induced flood of GM crops. Even without the ‘help’ of the TTIP talks, the Cameron government has made it abundantly clear that it is keen to see GM crops planted in England. In parallel, the UK has consistently lobbied in Europe to weaken regulations designed to protect public health and the environment. And on pesticides, the UK has a cavalier attitude to the precautionary principle. For example, the British government lobbied strenuously against EU restrictions on neonicotinoids, despite a European moratorium having strong public support. And it then caved in to pressure from the UK National Farmers’ Union to allow farmers to spray these bee-harming pesticides in some regions. And neonicotinoids are not a one-off. The UK’s farming minister George Eustice openly says that Brexit will allow the EU’s precautionary principle to be reformed in favour of a US-style approach to pesticide approvals that will allow faster pesticide authorisations. Some other European member states are relatively cautious and more responsive to public health concerns. For example, France and Germany have not voted in favour of the re-approval of glyphosate weedkiller, which was designated a probable human carcinogen last year by the World Health Organisation’s cancer agency. The UK, predictably, has been a cheerleader for glyphosate re-approval. The only thing that has kept the Cameron government in check regarding the planting of GM crops and the use of dangerous pesticides is the UK’s membership of the EU. Half of Europe’s member states and three of its regions oppose the planting of GM crops. It is these countries that have so far prevented the necessary qualified majority vote being achieved that would allow GMO cultivation in all countries of Europe, including the UK. A new “opt-out” law allows member states that oppose GMO cultivation to opt out of growing GM crops approved at an EU level. Unfortunately the new law also allows pro-GMO countries to “opt-in” to GMO cultivation. Outside the protective fold of the EU’s widespread skepticism towards GMOs, Cameron’s government is likely to waste no time in opting for GM crop cultivation, even though Scotland, Wales and Northern Ireland have all taken advantage of the “opt-out” law. I’ve repeatedly heard MEPs from other EU countries express bafflement at the evangelical cheerleading of the UK government for GM crops in Brussels. One MEP added that he had never heard anything like it from any other country, even Spain – the only EU country that grows a GM crop in any significant quantity. The idea that a UK “freed” from the EU would also be “free” from TTIP-type policies is not credible. As the Green MP Caroline Lucas has made clear, the UK government is one of the main driving forces for TTIP adoption in Europe. 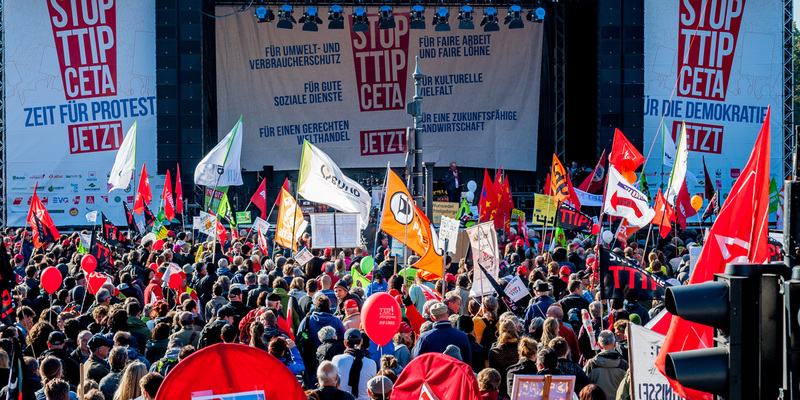 Other European governments are skeptical of TTIP in a way that the Cameron government has never been. France has even threatened to block the deal; German agriculture minister Christian Schmidt has criticized the US approach to the TTIP talks; but the British government, in contrast, has done everything possible to push for the most extreme version of TTIP. It is certain that a post-Brexit British government would pursue exactly the same policies that TTIP stands for: pro-GM crops, pro-pesticides and intensive farming, and pro-creeping privatization of the National Health Service. It is also clear that the British government’s free market fundamentalists would seek not just a faster but a more “ambitious” free trade deal with the US – in other words, TTIP on steroids. The government would in effect replace our allegiance to Europe with an allegiance to the US, the chief originator and driver of the GMO farming model. Similarly, by working together with civil society across Europe, we have been able to place effective checks on the use of GM crops and pesticides that have proved impossible to achieve at Westminster.